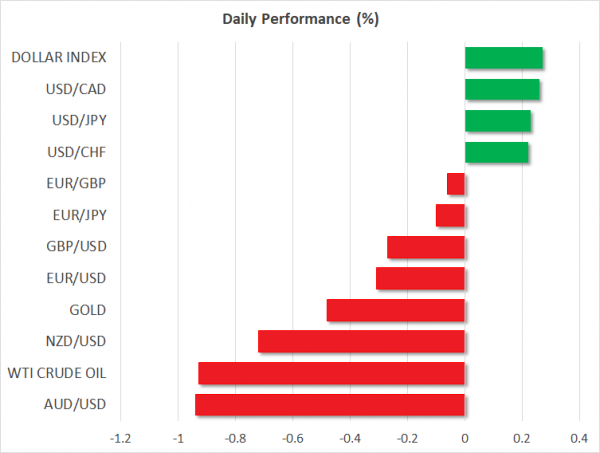 FOREX: The US dollar continued its positive move (+0.23%) versus the Japanese yen on Wednesday and is set to post the third consecutive bullish day, while the US dollar index rose by 0.29%. Pound/dollar edged down by 0.25%, whilst euro/dollar dived by 0.35% to trade near the 1.1700 psychological level. Commodity-linked currencies headed lower after Trump’s administration warned China with further tariff measures targeting $200 billion products imported from the country. Aussie/dollar tumbled by 0.91% slightly below 0.7400, while aussie/yen fell by 0.86%. Kiwi/dollar was down by 0.70% at 0.6789. Finally, dollar/loonie rose by 0.25% to 1.3142 a few hours before the Bank of Canada announces its rate decision. STOCKS: European stocks traded significantly lower today, paring the gains of the preceding days following fresh trade threats from the US. The pan-European STOXX 600 tumbled by 1.14% and the blue-chip Euro STOXX 50 moved lower by 1.07% at 1100 GMT. The German DAX 30 retreated by 1.24% with all sectors being in the red, the French CAC 40 weakened by 1.05%, the Italian FTSE MIB fell by 1.22% and the Spanish IBEX 35 dropped by 1.13%. US stock futures were pointing to a negative open. COMMODITIES: Oil prices were heading downwards as a global trade war could harm demand for the commodity. OPEC’s monthly report also raised demand concerns after OPEC forecasted a slowdown in 2019. West Texas Intermediate (WTI) crude oil dived by 0.86% to $73.47 per barrel, while London-based Brent plunged by 2.09% to $77.24 per barrel, erasing the previous two days of gains. Moreover, copper is one of the worst performing commodities as it dropped by 2.70%, creating a 1-year low. In precious metals, gold dipped to $1,250 per ounce, losing 0.38% on the day. Bank of Canada’s monetary policy will be the highlight event on the agenda today, while the US calendar is scheduled to deliver June’s PPI readings. Still, with the US President escalating trade tensions with China, investors might have less appetite to switch funds from safe havens to riskier assets. At 1400 GMT, BoC policymakers are widely expected to raise interest rates by 25 bps to 1.50% after keeping borrowing costs unchanged since the start of the year, probably saying that encouraging economic data, including a stronger labor market and higher inflation are a sign that the economy could operate effectively under a less accommodative monetary policy. However, the question remains whether the central bank will continue to reduce stimulus in the coming months as uncertainties arising from the US trade strategy and further retaliatory measures from other regions such as China and the EU could harm the global economy. Therefore, investors will shift their focus to the rate statement published along with the decision and listen to the press conference due at 1515 GMT to figure out how the path of interest rates will develop in the future. In case the BoC adopts a dovish stance in the face of trade risks, the loonie could weaken. Meanwhile in the US, firms got another threat from the White House after sources said that the US President is considering slapping additional tariffs of 10% on $200 billion goods imported from China – the biggest list of goods announced so far. With China showing no reluctance to fight back so far, markets will be eagerly waiting to see whether the fresh warnings could activate stricter countermeasures from China, a move that could boost fears that a global trade war is nowhere near to its end. In terms of data out of the US, headline and core PPI figures for the month of June are expected to improve on a yearly basis, while May’s wholesale inventories are anticipated to grow at April’s pace. Upbeat prints could support the dollar but a potential negative response from China could overshadow any bullish sentiment in the market. Yet, it is worth noting that the greenback showed resilience against trade risks recently, posting short-lived losses. In oil markets, the Energy Information Administration will report on US oil inventories at 1430 GMT, bringing some price volatility. As for today’s public appearances, Bank of England’s chief Mark Carney will be speaking at a conference on the Global Financial Crisis hosted in the US at 1530 GMT, while at the same time concluding remarks by the ECB Executive Board Member Daniele Nouy at the 9th ECB Statistics Conference in Germany will be in focus as well. A two-day NATO summit will begin today in Brussels, with NATO leaders together with Sweden and Finland, the EU Council and Commission Presidents having dinner today at 1730 GMT to discuss transatlantic relations and current security challenges. Note that the US president, who will be attending the event, is critical of his NATO allies’ defense spending plans, labelling them as inadequate.